Our knowledge and experience as marine professionals has allowed us to become the point of contact for a number of high profile film companies. Eye to Eye Marine Encounters has the expertise and connections to provide the best vessel, people and locations for any professional production team. 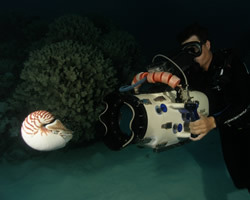 There are a lot of considerations to take into account with natural history filming, particularly in a marine environment. Our 30+ years of working on the Great Barrier Reef has given us the edge in understanding animal behaviours, seasonality and where and how to set up for winning shots. The tendency for film crews to come back time and again to work with us makes us proud of our service and contribution to the industry. We welcome you to contact any of the above production companies for references of our skills and quality of work. In addition to creating customized expeditions, Eye to Eye also offers a guide service for clients with their own private vessel. Our expert team of highly trained crew are available to take you to the best sites on the reef depending on weather conditions, tides and your areas of interest. With their wealth of knowledge, our guides will also provide extensive interpretation of the marine world and information on research projects carried out in the area. As one of 9 swimming-with -whales endorsed operators on the Great Barrier Reef, our guide service is a 'must do' for winter visitors (June/July). 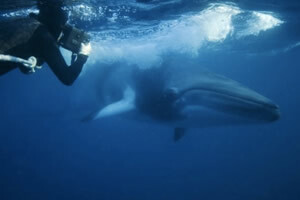 All staff are experienced in both minke whale behaviour and how to manage these interactions in a sustainable way. They also know just what it takes to create a meaningful wildlife encounter and an unforgettable experience for both humans and whales. Guide's skills range from: Master IV & V, Dive Instructor, Dive Master, Marine Biologist, Engineer, Photographer, Videographer, & Chef. 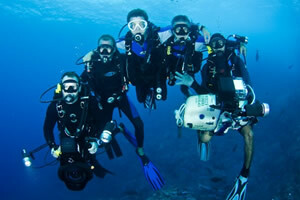 - All crew are experienced divers and have extensive knowledge of the local area. - Film crews/photographers are available upon request. 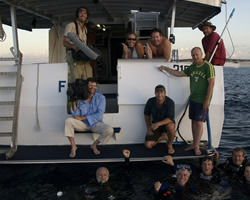 JR was our skipper for the BBC series 'Great Barrier Reef', and lead a variety of boats to a myriad of filming locations all over the reef over a course of a year. His knowledge of the reef; its wonders and pitfalls as well as his understanding of the complexities of filming expeditions put our camera teams in the very best locations at the best times. He was very much more than a skipper to us, his knowledge of the animals in particular made him a key member of the production team. Despite the considerable challenges of wildlife film making JR's ability to handle any conceivable situation in characteristic good humour meant our team always knew that they were in safe hands. For all professional photographers and film makers contemplating the prospect of documenting the dwarf minke whales, I highly recommend Eye to Eye Marine Encounters. 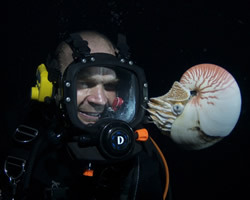 John Rumney worked many late hours on my behalf to ensure I was with the minke whales for the entire season. This included finding boats to use under his permit and coordinating with other permit holders. No other company I've worked with has gone to these lengths and the results are evident in my photographs.